Miguel (voiced by Anthony Gonzalez) is 12-years-old, is a member of an incredibly loving family and has no wish whatsoever to grow up to be a shoe cobbler like his parents, his grandparents and all his ancestors going back more generations than he can count. Instead, he wants to be a singer, a crooning cowboy like his favorite movie star, the late, great matinee idol Ernesto de la Cruz (Benjamin Bratt). But his family is dead-set against anyone in their brood becoming a musician, and they have been since his great-great-grandfather left his great-great-grandmother, as well as his great-grandmother when she was still nothing but a child, to fend for themselves so he could make his fortune as a singer. Ever since it’s been nothing but shoes for every member of the family, not a single person willing to entertain Miguel’s dreams of guitar-strumming stardom no matter how boisterous his protestations. On Día de Muertos, a.k.a. the Day of the Dead, Miguel discovers a shocking secret. His family knew Ernesto de la Cruz. More, it appears the famous star might have been his great-great-grandfather. All of which makes it perfectly acceptable in Miguel’s mind to break into the Mexican icon’s crypt in order to borrow his prized guitar in order to participate in a local singing competition scheduled for that evening as part of the holiday celebration. But when Miguel strums the guitar he discovers he can travel to the Land of the Dead. 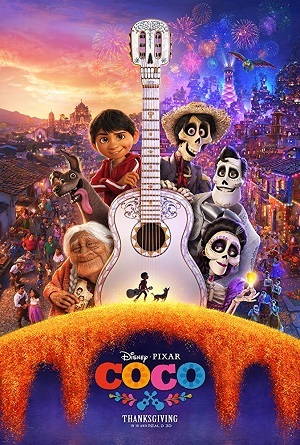 With the assistance of a down-on-his-luck skeleton named Héctor (Gael García Bernal) the youngster goes on a quest to find Ernesto de la Cruz, certain that if he does so everything in the mortal world will be set right and he’ll be allowed to follow his dream of musical stardom with his family’s heartfelt blessing. Pixar’s latest animated offering Coco is a pleasant enough diversion, offering colorful visual delights that are as imaginative as they are gorgeous. Director Lee Unkrich (Toy Story 3) and co-director Adrian Molina (The Good Dinosaur) go out of their way to be respectful to the Mexican holiday by urging their cadre of writers to craft a coming of age scenario that feels refreshingly authentic. The same goes for the richly talented vocal ensemble, the likes of Renée Victor, Alfonso Arau, Herbert Siguenza, Gabriel Iglesias and the great Edward James Olmos joining Bratt, Bernal and newcomer Gonzalez as part of the production. It’s a fun little endeavor, the climactic act a particular delight as Unkrich and company bring all of the various plots and subplots together in a way that is energetic and suspenseful as well as turning out be nothing less than happily satisfying. And yet, I cannot say I loved everything about the animation studio’s nineteenth feature-length motion picture. It took me the longest time to get interested in what was going on with Miguel. The kid is oddly unlikable for a good quarter of the story, his chirpy selfishness rubbing me the wrong way. But the same goes for many of the members of his family, especially his grandmother Abuelita (Victor), her cantankerous one-dimensional anti-music belligerence tiresome. Once Miguel found himself in the Land of the Dead I almost didn’t care if he returned to the realm of the living, and it’s something of a wonder I became as emotionally invested in his adventure learning about his ancestors and discovering the truth of his great-great-grandfather’s disappearance as much as I eventually did. Once Héctor is introduced things do start going in the right direction, and while the surprises involving him aren’t shocking, the way his relationship evolves so naturalistically with his newfound friend Miguel oftentimes is. 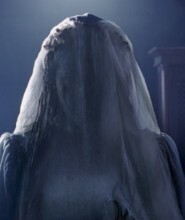 I was also somewhat astonished Unkrich and his team has the audacity to introduce some pretty adult-oriented themes and ideas during the film’s final third, revelations about Ernesto de la Cruz undeniably startling. Then there is the infusion of color and texture into the feature as the Land of the Dead is spectacularly revealed, and even for the talented artists at Pixar the attention to detail on the part of the animators is simply extraordinary. 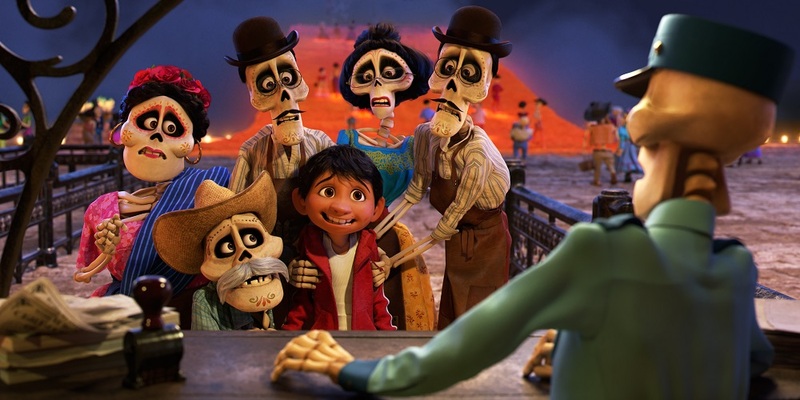 Comparisons to 2014’s The Book of Life produced by Guillermo del Toro are unavoidable, the two animated productions sharing a noticeable kinship even if no one involved with the creation of Coco would likely want to recognize it. Yet both revolve around the Mexican holiday Día de Muertos and each relies upon the love of music (as well as a collection of pretty terrific songs) to fuel their respective tales. Pixar’s effort is more stunningly animated, on that front there is no debate, while the del Toro production is lighter on its feet and to my mind more consistently enjoyable even if it never quite rises to the same heights this new feature sometimes manages to soar to. Coco is worthwhile, just not as much so as I honestly hoped it would be. Its narrative inconsistencies are frequently frustrating, and the fact it ends up being an “all or nothing” sort of story (meaning there is no middle ground in the love-hate battle involving music and musicians) partially rubbed me the wrong way. But cultural representation matters, and the fact Unkrich and his team treat Día de Muertos with such respect and reverence is a thing worth celebrating. Although I didn’t love this movie I still liked it just enough to sing many of its praises, and even if my song isn’t a loud one, I’m still happy to be belting it out for all to enjoy nonetheless.